The mission of ICE-PAC is to influence public policy decisions made at the state level by supporting Illinois candidates and issues that value human life, advance family stability, and uphold the dignity of all people. We are a pro-life political action committee and our signature issue is parental notification. Many citizens in Illinois are concerned about issues of life, family and dignity, but need a vehicle to express their opinions. 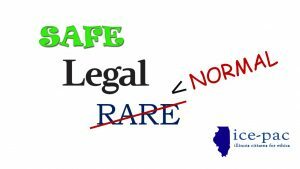 Illinois citizens want their voices on right-to-life to be heard, and they want to be assured that traditional, mainstream moral values are reflected in our state laws and policies. ICE-PAC will advance this mission in a practical, strategic, and constructive manner. ICE-PAC will support Illinois elected officials and candidates who recognize these concerns and who are willing to address them. We will endorse and give campaign support to Illinois candidates who are enthusiastically pro-life and support the right to life agenda. We will also defend elected officials who “cross the aisle” and become deciding votes on important moral issues, if they subsequently come under attack from anti-family-value political action committees, as a direct result of their pro-family-value votes. ICE-PAC will take actions to promote moral issues and positively influence the democratic process in order to ensure that these pro-life, pro-family values are reflected in decisions made in Springfield, Illinois.